Dhaka, Dec 3 (Just News): Nasir Hossain's heroics with the ball allows Sylhet an easy ten-wicket victory over Chittagong Vikings after the latter were bowled out for 67 runs. Sylhet Sixers openers Andre Fletcher and Mohammed Rizwan notched up the required target of 68 to give Nasir’s side a ten-wicket victory over Chittagong Vikings. Both openers batted with patience and confidence as Sylhet notched up the lowly total without losing any wicket. Fletcher went after Nayeem Hasan in the sixth over hitting him for two four’s and a six while Rizwan struck three consecutive boundaries off Tanbir Hayder in the eighth over as the Sylhet openers made their intentions clear. Sylhet notched up the required total in just 11.1 overs, Rizwan scoring an unbeaten 36 off 33 balls while Fletcher was also not out on 32. However, the real damage was done by the Sixers bowlers – lead by captain Nasir Hossain. When Chittagong Vikings opener Luke Ronchi lifted the first delivery of the innings from Nasir Hossain over the bowler’s head for six with an elegant drive, it certainly was not an indication of how the day was going to go for the Vikings or Nasir Hossain for that matter. The all-rounder bagged five Chittagong wickets in his four overs, as his double strike in the very first over, saw the Vikings fail to recover from an early slump. Nasir, after being hit for a six in the first ball by Ronchi then took his revenge immediately as his second delivery slipped past the batsman’s bat and clipped the stumps. In the last ball of the over, opener Soumya Sarkar departed following a soft dismissal as he failed to check his drive and gave a return catch to the bowler. Luis Reece tried to put the pressure back on the bowling team but he fell leg-before to Nasir in the third over, failing to connect his slog and the ball hit him on the back leg. Sikandar Raza was out following a fantastic diving catch at deep-midwicket off the bowling of Sharifullah as Vikings lost their fourth wicket for 21 runs. Nasir then trapped Tanbir Hayder leg-before in the fifth over to get his fourth wicket. The pitch deceived with its slowness as the ball held up after pitching and it contributed to Nasir’s cause as the bowler took advantage of batsmen playing their shots early. Staan van Zyl fell after he produced a top-edge, trying to play his shot early and was held out at mid-wicket. 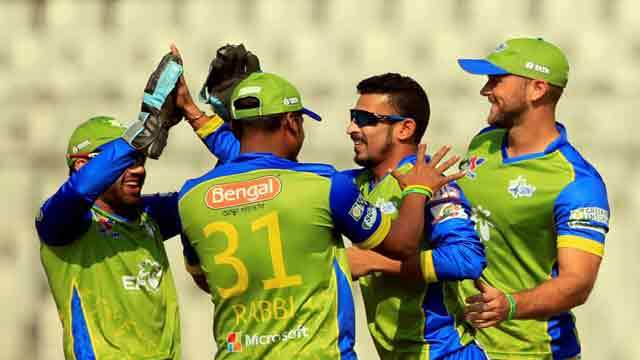 Left-armer Nabil Samad then bagged three wickets as Chittagong were bowled out for the lowest total of 67 in this season’s BPL.